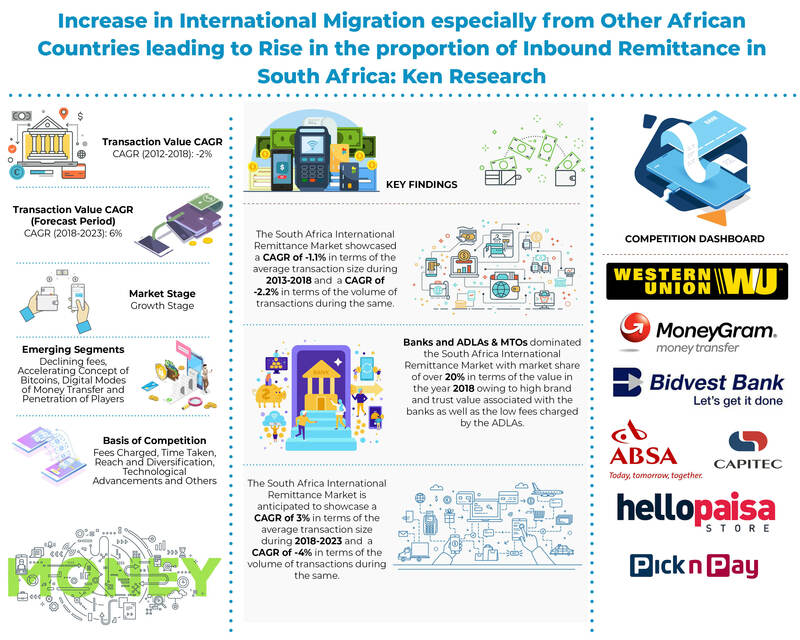 The report titled “South Africa Domestic and International Remittance Market Outlook to 2023 – By Channels Used (Banking Channels, Retailers, ADLAs & MTOs and Others), Remittance Corridors (Inbound-Outbound and Rural-Urban)” provides a comprehensive analysis of South Africa’s Remittance Market including market evolution, overview, genesis, market size and market segmentation. Extensive focus has been placed in quantifying the transaction value and volume over the period, 2013-2023. The report covers aspects such as market segmentation (by channels used, by corridors and by income level) and an extensive snapshot on the bill payment market in South Africa. The report has covered the international and domestic space exclusively focusing on over the year’s computation & interpretation of change in volume, value and average ticket size of transactions in the country. Income earned & change in commission charged has been scrutinized well followed by explicit analyst explanations. Competitive landscape of major players including ABSA Bank, Capitec Bank, Bidvest Bank, Standard Bank, Western Union, MoneyGram, Hello Paisa, Mama Money, Mukuru, Shoprite, SPAR, PEP Stores and Pick n Pay have been covered including company overview, major business strategies, USP, distribution network, remittance services offered, financials and various other parameters. The report also covers future industry analysis (by value, volume and average transaction size), future market segmentation, SWOT analysis, growth opportunities, upcoming trends & analyst recommendations. Market Overview (Current and Future): South Africa domestic and international remittance market are highly concentrated and in the growth stage. The market includes both formal and informal payment service providers including banks, money transfer operators, ADLAs, retailers and mobile wallets. Prominent business strategies adopted by major players to position themselves in the market include forming an extensive network & improved reach, new services launched & service innovation and better pricing & handy/transparent operations offered. The market has been fuelled by increased migration, rising government support for new competitors, declining fee charges and increased awareness towards digitalized remittance services. By Channel: International remittance market was led by banks and MTOs & ADLAs showcasing a robust CAGR close to 3% and 8% respectively during 2013-2018. ADLAs penetrated the market in 2015 and have been rising ever since. Retailers experienced a CAGR close to -1% in terms of value while the other players including post offices and hawalas experienced a double digit negative CAGR during 2013-2018 losing their share to other more organized players. Competition Stage and Positioning: The international market is concentrated with majority of the market being captured by MTOs & ADLAs in 2018. There are 4 major banks namely ABSA Bank, Capitec Bank, Standard Bank and Bidvest Bank which have been active in the space. 2 major MTOs include Western Union and MoneyGram while major 4 ADLAs include Hello Paisa, Mama Money, Mukuru and Exchange4Free. Major 4 retailers include Shoprite, PEP Stores, Pick n Pay and SPAR. Major competing parameters include fees charged, time taken for the transaction, services offered, reach of the service providers, trust value attached, technological advancements, promotional offers and transparency in costs. The market has become highly competitive in terms of the fee charged after the penetration of the ADLAs offering low fees to the customer’s thereby increasing competition. By Channel: Domestic remittance market was led by banks with highest market share showcasing a CAGR close to 1% during 2013-2018. Retailers followed by Mobile wallet companies acquired the second and third highest share in the base year. MTOs witnessed strong growth during 2013-2018 by value of transactions. Other players including post offices and hawalas experienced a decline in popularity with the coming up of other organized gateways. Competition Stage and Positioning: The domestic market is highly concentrated with majority share being captured by Capitec Bank, First National Bank, ABSA Bank, Bidvest and Mukuru in 2018 in terms of value of transactions. The market is expected to showcase a CAGR close to 12% and -7% by value and volume of transactions during 2018-2023.